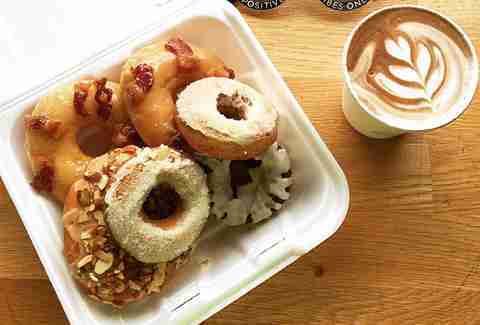 Cronuts may have had their moment, but good old-fashioned donuts are here to stay. 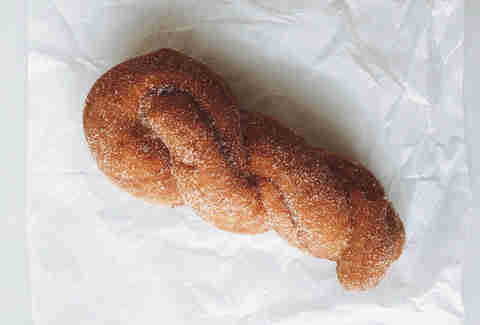 From cake donuts to yeast donuts, there's always a fresh batch of sugary sensations taking the Queen City by storm. To help you fill up on the city's finest pastries, here are the eight best places to get donuts in Charlotte. Donuts at a wine bar?! Yep, here they call them 'doughnuts,' and they are amazing. Foxcroft Wine Co., now in two locations, is an upscale wine bar and retail shop that also serves delicious food. 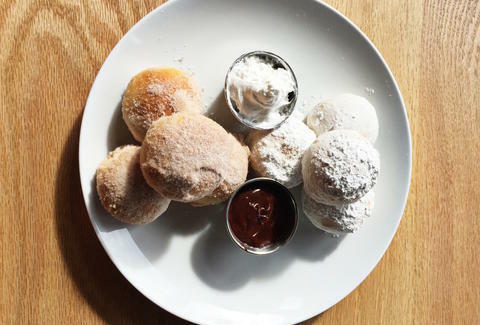 The doughnuts have a cult following and are served with dipping sauces such as chocolate ganache and marshmallow fluff cream. Wine and doughnuts make a well-balanced and healthy meal. Not only are the creations delicious, but the Suárez family history is fascinating. Carlos Suárez Sr., a former pastry chef with the now-closed Adams Mark in Uptown, opened Suárez Bakery in 1992. For over 23 years, the bakery has been a staple at Park Road Shopping Center and has served patrons cakes, cupcakes, and other scratch made goods. Anything with their signature chocolate ganache is a must try, as well as the cinnamon twist and the old-fashioned cake options. A few times a year -- to much fanfare -- the best-selling maple bacon bar becomes available for a limited time. The concept for Duck Donuts began on a family vacation in the beach towns of North Carolina’s Outer Banks. The opening of the shop in Dilworth was met with lines of patrons out the door and social media blowing up with photos of coveted donuts. All donuts are made to order and are always served warm and fresh. Pull up a stool and watch your donuts made right there in front of your eyes. The maple bacon is a great balance of sweet and savory, and you can never go wrong with either the shredded coconut or the rainbow sprinkles as topping choices. 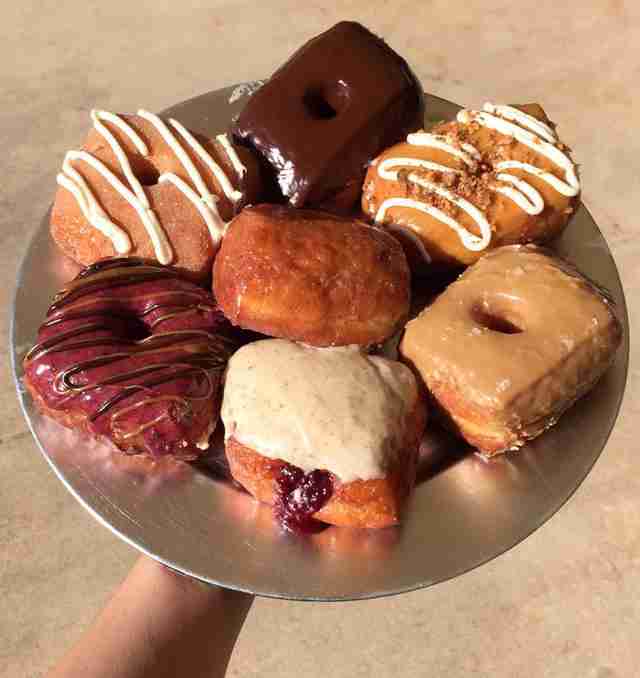 Joe’s Doughs was launched as a pop up concept by Joe Pepe in October 2014 and revolutionized the idea of pop up donut shops in Charlotte. When a Joe’s Doughs pop up is at The Daily Press, lines of patrons have been known to snake around the building. 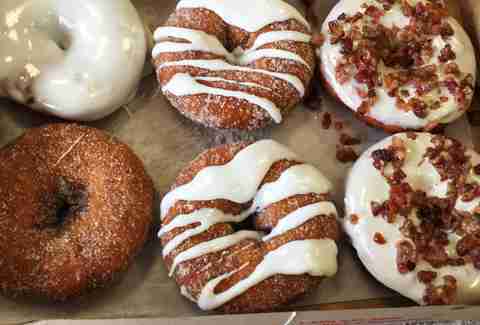 The Maple Bacon donut will make you want to elbow people out of your way. The Peanut Butter S’mores donut will inspire you to sit alone in a quiet corner as you enjoy the rich treat in blissful silence. Joe’s will open its first storefront location in spring 2016 in NoDa. This farm-to-table concept began as a delivery donut service in October 2013. Due to intense demand from customers, they opened their first storefront location months later. The shop sources as many ingredients (dairy, eggs, fruit, flour) from the local farming community as possible. Donut flavors change weekly and seasonally. Be sure to check the online menu and beware the dreaded “SOLD OUT” listed next to a flavor. The Cinnamon Sugar with Cream Cheese Frosting is not to be missed, and if it is available, grab yourself an apple pie filled donut. 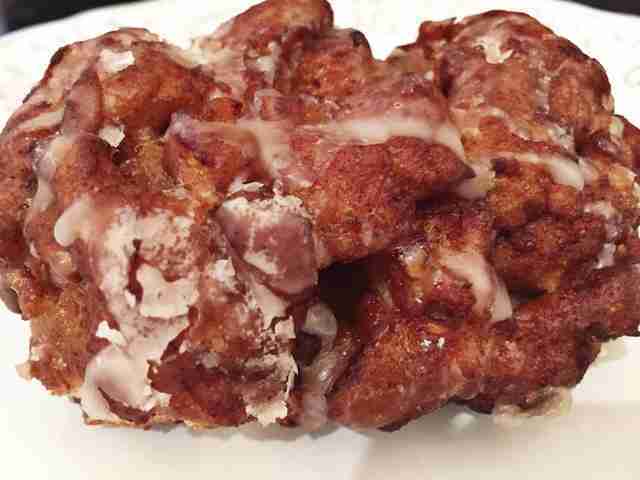 Located on Polk St, MJ Donuts is a no-frills shop nestled in an unassuming shopping center. Here the focus is on creating homemade favorites like the double chocolate cake, the buttermilk with sprinkles, and their insane apple fritter. And don’t forget the donut holes! You can get a dozen free when you order a dozen donuts. SURGAR. 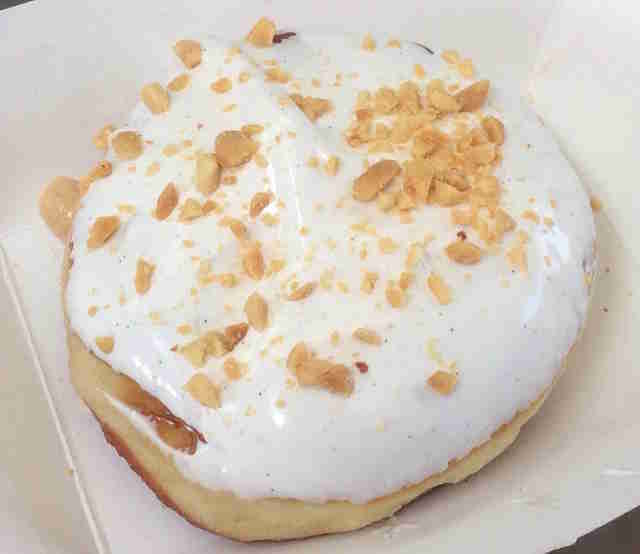 Handmade Gourmet Donuts began as the first donut food truck in Charlotte using premium ingredients such as French chocolates, fresh fruits, real cream, eggs, and butter to create gourmet pastries. The vanilla bean glazed donut and Southern banana pudding donut are life changing and have had all their calories removed. Never afraid to experiment with flavors, the new SUGAR. savory donuts include options such as pepper jack cheese potato and bacon "hash" filled donut and an "Egg in a Basket" (a popover with organic black forest ham, cheddar cheese, scallions, and a hard boiled egg baked into the center). Sure, Krispy Kreme is a chain, but it was founded in North Carolina over 75 years ago and is a engrained in the Charlotte area, as well as all throughout the state. The “Hot Now” sign lights up, and we Charlotteans lose our ever-loving minds. 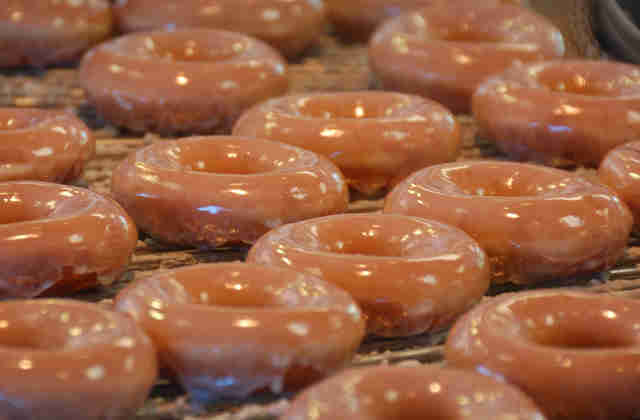 Krispy Kreme has also partnered with the Carolina Panthers and created a promotion that the Monday after a Panthers victory a dozen original glazed doughnuts can be bought for $3.99. They handed out free donuts the week before the NFC Championship in their mobile oven trucks in uptown Charlotte. Hard to get more American than football and addictive sweets. Erin Maddrey enjoys writing about food, beverages, and all things Charlotte. Due to her love of these things, she can be frequently found at the gym. Follow her and her Charlotte adventures on Twitter and Instagram: @ErinMaddrey.